I've had this sitting around for a while. 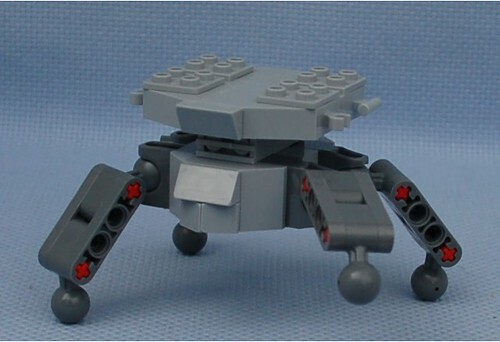 Definitely inspired by the spider tank in the Ghost in the Shell anime. No Attachments but plenty of hardpoints. Oh, I like this one. It has this down-to-earth utilitarian look I enjoy. It does look to me like a multi-purpose drone tank. The number of attachment points also brings to mind a swathe of possibilities regarding equipment its designs. Nice use of big ball joints, Mantisking! Francisco Duarte wrote: Oh, I like this one. It has this down-to-earth utilitarian look I enjoy. It does look to me like a multi-purpose drone tank. The number of attachment points also brings to mind a swathe of possibilities regarding equipment its designs. Hopefully I'll get around to designing Attachments for it soon. And maybe another one to keep this one company. VitorFaria wrote: Nice use of big ball joints, Mantisking! Thanks! It uses eight of them though.